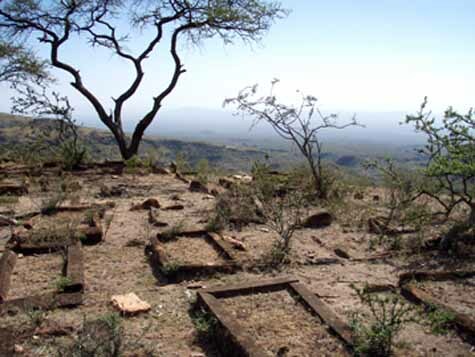 PARIS, 7 APRIL 2007 - The ruins of three medieval towns were discovered last January in Ethiopia during the Gendebelo/Nora I exploratory mission coordinated by the French Center for Ethiopian Studies in Addis Ababa, directed by Francois-Xavier Fauvelle, a researcher at France's prestigious multi-disciplinary National Centre for Scientific Research (CNRS). These towns are probably the first material vestiges of the Shoa (or Shewa) kingdom, an important Muslim kingdom known from texts to have dominated the region from the 10th to the 16th century. Until now its precise place on the map has never been clear. The kingdom controlled one of the most important trade routes of the time, between the Christianized Ethiopian highlands and the Muslim ports of the Red Sea and the Gulf of Aden. Perched up at about 1300 meters, on the escarpment of the Rift Valley in an area now covered in thick brush and scrub, the remains of mosques, residential areas and city walls, and buildings with walls several meters high stud the sites of the medieval towns of Asbari, Masal and Nora. The population of the region is composed of mainly Muslim rural mixed farming communities, who dispute their rights to this area. The areas around these ancient sites show traces of terraced farming, but today they are pastures. The ruins of the town of Asbari cover a vast rocky spur on the eastern edge of a cliff. The site is a small plateau at an average height of 1240 meters. The most visible element is a huge ruined mosque, which is relatively well preserved, and which is one of the largest known to date in Ethiopia. There are several Arabic inscriptions on the inner and outer wall. Apart from the great mosque, the site also contains vestiges of other cultural buildings with a mihrab (1), and smaller mosques or zawiya. A cemetery of several hectares containing hundreds of tombs covers the north side of the hill on which the mosque stands, and two of the boundary walls form its northern and eastern limits. At the west of the site, a meter-high, two-meter-thick straight wall running north-south for 4 kilometers cuts off all access from the plateau. Between this wall and the site itself, a vast area, today covered with scrub, shows signs of terracing. At the time when Asbari flourished, or after it fell into ruin, the site may have been colonized by a farming community. The ruins of the ancient site give the impression of a fairly sparsely populated city, although there are signs of some more densely populated areas, with certain traces of roads, or at least, of access routes near the city walls. The remains of the visible walls are not very high, and the tells (2) formed by the ruins are the only signs of the other structures. At least two long, continuous walls leading to the mosque seem to divide up neighborhoods. On the same mountain range, between the sites of Asbari to the north and Wassiso-Nora to the south, lies an important group of at least three medieval Muslim sites. They contain mosques or oratories, sometimes surrounded by boundary walls, and several vast, ancient cemeteries with several thousand tombs. The sites are covered with large quantities of pottery fragments and tools made of obsidian, a rock that is a kind of naturally occurring glass. There are also earlier tumuli (3) within the necropolises, probably dating from the High Medieval (4) period. There are no other known remains from this period in Ethiopia. Most of the tombs have no inscriptions on them, but one that had been partly described earlier is, in fact, quite exceptional. It is made from a single stone, and on its four sides are carved medallions with stars of Solomon and Arabic inscriptions showing that it is a royal tomb. Nora is situated on a rocky outcrop. 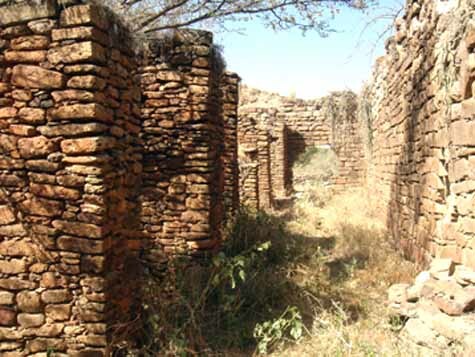 The number of ruins, which are sometimes one or two meters high, show that it was once a densely populated town interlaced with a network of streets with remains of ornamental tiling. The dwellings are distinctly rectangular, like traditional dwellings. But it is difficult to understand quite how the living areas and walled areas forming courtyards were organized. The streets climbing up in stages are all the more visible in the parts where they run around the urbanized area, right next to the city wall leading to the gates. Some of these streets have walls running along both sides of them, built like the walls of the ruined houses. The city wall is built of large blocks along the contour lines where the slope descends more sharply. Several circular ruins, the remains of defensive structures, are to be found along the inner perimeter of the city. The walls of the main mosque are still 4 to 5 meters high. A burial mound close by contains hundreds of Muslim tombs. Archeologists have found huge number of obsidian tools all over the site, usually scrapers or flint cores (5) and ceramic fragments. Pottery is particularly abundant on a large tell about 200 meters to the northeast of the mosque, at the edge of the necropolis. The site and shape of this, and the hypothesis of the remains of a facing at the base, along with the large quantity of ceramics, would suggest a tumulus. At least three other tumuli have been identified within the city walls, all close to the necropolis. One of these is open, and the cella (6) can be seen. This is formed of a horizontal slab perpendicular to the slope, on two walls of lateral blocks, which is typical of medieval funeral monuments of other regions in the Horn of Africa. The size and concentration of these towns lead historians and archeologists to believe that they correspond to one or other of the hitherto undiscovered Muslim towns mentioned in Muslim texts. These towns, which may have been founded at different times, may well have co-existed at one point, probably when the Ifat kingdom flourished in the 14th and early 15th century. But it is also quite possible that, before they were absorbed by the sultanate of Ifat, these towns formed the heart of the Muslim Shoa kingdom. This is the hypothesis the researchers are working on, and it will be studied in greater depth during future missions. The Gendebelo/Nora II mission will continue to investigate the Nora site and its surrounding area (rocky material, terracing systems) and Gendebelo/Nora III will carry out the complete topography of the visible parts of the site. In 2008, the Gendebelo/Nora IV mission will begin the dig on the Nora site. (1) Mihrab: a niche in the wall of a mosque facing Mecca. (2) Artificial hill, mound or tumulus formed by ruins. (3) Artificial mound, made of earth and stones, piled up over a tomb. (4) 7th to 15th century A.D.
(5) Core of flint or other hard rock from which thin flakes are produced and used for prehistoric blades. (6) Place in a Greek or Roman temple where the statue of the god was placed.